Given this heightened interest around the world, three leaders from the weather and climate research communities share their perspective on how to address this challenge in a new open-access paper in Nature Partner Journals – Climate and Atmospheric Science. The authors include Annarita Mariotti, Director of the NOAA MAPP Program, as well as Paolo Ruti and Michel Rixen, who coordinate research for the World Weather Research Program (WWRP) and World Climate Research Program (WCRP), respectively. While scientists have made significant progress, the authors emphasize that both weather and climate groups must work together to bridge the S2S prediction gap. “A lack of engagement from either side would result in slower and more costly progress,” said Mariotti, lead author of the paper. 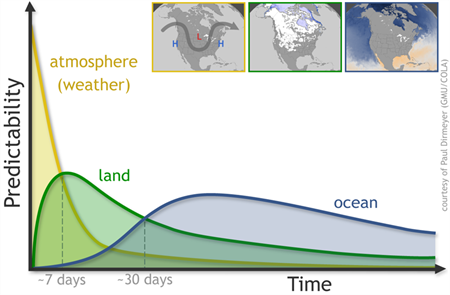 Historically, the weather and climate research communities have worked separately because of the different atmospheric dynamics at play in these distinct timescales: For weather models, scientists focus primarily on illustrating atmospheric processes. Climate models, on the other hand, take interactions between the atmosphere, ocean, and land into consideration. These components change slowly and can help guide how the atmosphere may evolve over longer timescales. At different lead times (horizontal axis), different parts of the Earth's climate system (atmosphere, purple; land surface, green; ocean, blue) become more or less important to forecast skill (vertical axis). For short lead times, knowing the initial state of the atmosphere counts the most. At 2- to 4- week lead times, knowledge of the land surface is also needed, including things like soil moisture, snow cover, and vegetation. Forecasting more than 30 days ahead typically requires knowledge of the ocean, such as the sea surface temperature variations like to El Niño. Credit: NOAA Climate.gov graphic, adapted from original by Paul Dirmeyer. Because the S2S timescale is in between, the authors explained that its prediction can’t rely solely on weather or climate models. That’s why scientists have started to fuse techniques from weather and climate forecasting to bridge the prediction gap and provide “seamless” predictions across the weather-climate continuum. Climate modelers now use higher resolution and more sophisticated illustrations of atmospheric processes that better depict the initial state of the atmosphere. Alternatively, weather modelers now incorporate interactions between the atmosphere and other Earth system components. In addition, research has shown how slower evolving climate processes can influence weather and the likelihood of extreme events, further linking the two timescales. “Significant progress has been achieved by integrating the weather and climate communities and leveraging their respective strengths, otherwise not achieved by only separate developments,” said Ruti. Going forward, the authors note that continued collaboration is crucial. Fortunately, there are national and international programs already in place that draw from the best of the weather and climate communities to facilitate joint efforts. This figure illustrates the S2S or weather-climate prediction gap. It shows estimated forecast skill based on lead time or how far ahead the forecast is issued, as well as the types of atmospheric phenomena being predicted for each time range. 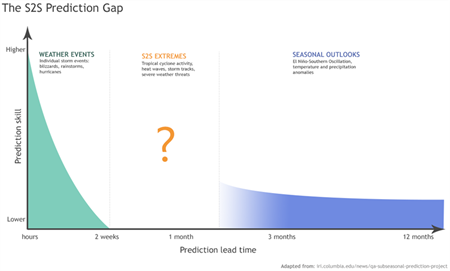 Going from weather to seasonal forecasts, prediction skill decreases. Much less is known about forecast skill and predictability sources in the S2S range, 2 weeks up to a season. Credit: NOAA CPO graphic adapted from original by Elisabeth Gawthrop and Tony Barnston, IRI. The WWRP and the WCRP created the international S2S Prediction Project with the goal to bring the weather and climate communities together and bridge the prediction gap. This effort motivated other research initiatives such as the NOAA MAPP Program’s S2S Prediction Task Force, co-supported by the National Weather Service and other agencies, which coordinates program funded weather and climate scientists to rapidly advance research goals and objectives. Mariotti wants to see the weather and climate programs contributing to the next 5 year phase of the S2S Prediction Project to enhance this effort. “It will be important to further capitalize on the expertise of the weather and climate research communities to improve [S2S] prediction skill, to promote the initiative’s uptake by operational centers, and fundamentally to build a more seamless research-to-operations framework,” said Ruti and Rixen. The paper is published in the open-access, online-only journal “NPJ Climate and Atmospheric Science” and can be read in full by visiting Nature.com.